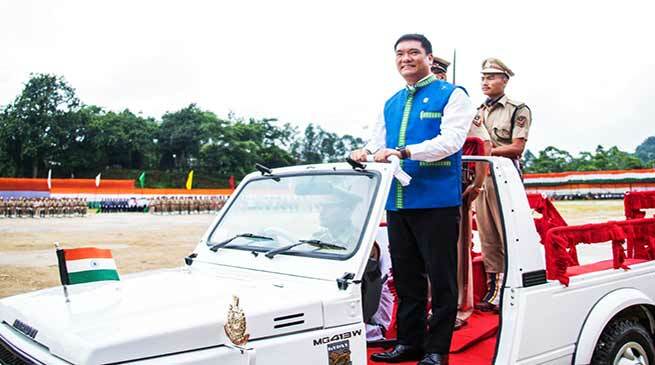 On the occasion of 72 Independence day celebration at IG Park, addressing the gathering Chief minister Pema Khandu said that “During last one year the State has witnessed faster change, greater transparency and unprecedented development in all sectors. Our government’s philosophy has been inspired by Deen Dayal Upadhayay ji’s vision of “Antyodaya”, an all-inclusive growth where the government reaches to the last man. Our Government has worked with the spirit of ‘Team Arunachal’ where we have tried to involve everyone and exclude no one. My dear sisters and brothers of Arunachal! On this auspicious occasion of 72nd Independence Day, I extend my heartiest greetings and good wishes to you all. I pay homage and profound regards to our great freedom fighters and visionary leaders who made many personal sacrifices so that we could live as a free nation. Today is a day of celebrations that instils in us a sense of solidarity, a feeling of fraternity and a bonding towards our fellow citizens. Freedom fighters sacrificed their lives so that we could breathe the free air. People like Bal Gangadhar Tilak, Lala Lajpat Rai, Pandit Madan Mohan Malviya, Mahatma Gandhi, Subhash Chandra Bose, Pandit Nehru, Sardar Vallabhai Patel, Bhagat Singh, Sarojini Naidu and many others gave up all they had for our freedom. Looking closer we have heroes like Tirot Singh, Rani Gaidinliu, Gopinath Bordoloi and Matmur Jamoh. While I mention the glittering stars of the freedom struggle, I also pay gratitude to the numerous unsung heroes- our teachers, labourers, doctors, engineers, farmers, journalists, academics, students and others who helped us attain and preserve this freedom. The day also belongs to the members of our armed forces-the Army, Navy and the Indian Air Force, our Para-military forces, State Police personnel and our border guards who have so valiantly and successfully defended the pride and honour of our motherland over all these years. Today we have all assembled here to celebrate the festival of independence, ‘Swatantrata Diwas’. It is important on this day to understand what is independence. When Britishers left, we were told that now we are free. All we the citizens have to do is, go vote and government of Free India will take care of everything. Is this the correct understanding of freedom? Can we have independence without participation of the people? Can this country, can this state be improved without the people? Pradhan Mantri Narendra Modi ji often says that he is the first Prime Minister of India born after independence. He did not get a chance to fight and die for the motherland but he has the opportunity to live and work for the motherland. I am one of the member in the Team India led by our beloved Prime Minister Modi ji and I am working towards making our state Arunachal Pradesh the best state of Bharat. I have a dream for our state Arunachal Pradesh and you the people of Arunachal form an integral part of that dream. Let us also reminisce the struggle that our people have made in bringing our state from being the neglected area of the North-Eastern region to what it is today “Arunachal Pradesh”. After independence, we were called NEFA with our administrative headquarters being in Shillong. We were administered from Shillong until 1974 when our headquarters shifted to this place “Itanagar”. Thus, we lost precious 27 years by being managed from a place far away from our state. Our state has also suffered a lot during 1962 Indo-China war and the memories of that are still alive. We were given full statehood only in 1987 that was 40 years post independence. This is perhaps the major reason why we are left behind other states even though our state has got huge potential specially in development of natural resources. Had our state’s hydropower potential would have been realised 40 years back, we would have been one of the last producers of electricity in the country by now. Even after starting late, we are now moving ahead at a very fast pace and I am sure that in next 5 years, our state will transform into one of the most progressive states in the nation. Our government’s philosophy has been inspired by Deen Dayal Upadhayay ji’s vision of “Antyodaya”, an all-inclusive growth where the government reaches to the last man. During last one year the State has witnessed faster change, greater transparency and unprecedented development in all sectors. Our Government has worked with the spirit of ‘Team Arunachal’ where we have tried to involve everyone and exclude no one. We have shown immense tenacity in taking the boldest decisions ever taken by any government in the state till date. Transparency, integrity and honesty have been the sole mantra in our journey and I have given a government that has zero tolerance towards corruption. We all know that the bedrock for bringing development of any state is putting right people at the right place. To achieve this, there is a need of having free and fair recruitment process. My Government has taken all efforts to bring systemic changes in the recruitment processes in the state which will transform the governance in the state in the years to come. I personally believe that Government delivers only when it takes decisions after consulting all stakeholders. However, the consultation process must not lead to delay in taking such decisions. Since majority of the decisions in policy making and governance require cabinet approval, we have ensured that cabinet meetings are held regularly in the state. In a span of last 2 years, we had 28 cabinet meetings where more than 320 decisions have been taken. All the Group A and B recruitments are now being done through Arunachal Pradesh Public Service Commission which ensures free and fair selection process. In the ensuing Assembly Session, we will constitute Staff Selection Board to recruit all Group C posts. This will ensure that meritorious candidates are duly rewarded and will usher competitive spirit among our youths. I assure you all that our Government will take all possible steps to ensure that free and fair recruitment process is followed in all the departments of the state. There has been a visible improvement in work culture in last two years. The Team Arunachal mantra has ignited minds of our employees to deliver for good to the people of the state. This resulted in multiplying the State revenue from its past collection. While it was just Rs 927.18 Cr in 2015-16, an increase of only Rs 7.38 Cr from 2014-15, we generated Rs 1253.57 Cr in 2016-17, an increase of Rs 326.39 Crore. In 2017-18 our income stood at Rs 1598.49 Cr. The Government is also aware of the increasing unemployment in the state and we are taking all out efforts to provide jobs to our deserving youths. In last 1 year, we have created more than 1100 posts for teachers in education department which will not only give meaningful employment to our youths but will also improve the quality of education imparted in the state. Our state is having the largest area in entire North-East which has its both advantages and disadvantages. Though we have got enormous natural resources, but we are not able to develop towns and headquarters due to remoteness. In order to bring governance at the people’s doorsteps by closing in the remoteness, our Government has decided to create three more districts namely Pakke-Kessang, Lepa Rada and Shi-Yomi this year. To further penetrate government policies and its benefits to the remote corners, this year we had launched “Sarkar Aapke Dwar” with an aim to organise more than 250 administrative camps across the state. Under the scheme, more than 40 departments will reach out to the people to provide them services at their doorsteps. We have also enacted landmark Arunachal Pradesh Land Settlement and Records Amendment Bill, 2018. The amendment bill recognizes crucial ownership right to the indigenous people of the state which will lead to real price discovery of the land and will usher economic revolution in the state. We have also amended Arunachal Pradesh Panchayati Raj Act 1997 due to which the three tier Panchayati Raj system has been replaced by two tier system – Gram Panchayat and Zilla Parishad. The two tier system shall expedite planning process, quicken decision making and fast track development. Providing quality, affordable and timely health care facilities to the people is the topmost priority of our government. It is with immense pride that I share with you that our state will now be producing doctors on its own with the starting of The Tomo Riba Institute of Health & Medical Sciences (TRIHMS). The TRIHMS will have its own full-fledged trauma centre and cancer centre which will bring immense relief to our people who used to travel all the way to Assam for tertiary care. I assure you all that My Government will provide all out support in making the TRIHMS a Center of Excellence with State of the Art facilities which will produce world class doctors in the years to come. Our Government has also taken a historic step of providing health insurance coverage to all families of Arunachal Pradesh. For this purpose, we have launched Chief Ministers Arogya Arunachal Yojana(CMAAY) in the state. The scheme has provision to provide financial coverage for a family upto Rs 5 lakhs per year for Secondary and Tertiary Care Hospitalisation. We will expand the coverage of this scheme to empanel all the key hospitals across the country so that our patients get quality medical treatment at low expenses. I am also aware of the rising incidence of cancer incidences in the state. Under the CM’s Free Chemotherapy scheme free chemotherapy is being provided to APST cancer patients upto a ceiling of Rs. 10 Lakhs per patient. Our Government has instituted Renal Care Fund to provide relief of up to Rs. 10 lakh per patient suffering from kidney transplant problem. We have also launched a new scheme “Mukhya Mantri Rogi Kalyan Kosh” which will specifically focus on ensuring availability of medicines required as per the needs of the area. Each Deputy Commissioner will be given requisite funds for revamping the health care institutions as per the requirements. This has also brought the culture of decentralising the development process in our state. I appreciate the efforts of the Health Department in achieving 100% immunisation in Measles Rubella Vaccination. I would urge all my fellow Arunachalis to get their children immunised at the right age so that we are able to eradicate diseases like TB, Measles, rubella etc. completely from our state. We have kept sufficient incentives for the families which get complete immunisation doses for their wards. We are also adopting latest technologies in the health sector to bringing in transparency and efficiency. Human Resource Management Information System (HRMIS) on 28th July 2018 has been launched under the National Health Mission (NHM), which is believed to be the first of its kind in the state. This will digitise the entire service records of the staff as well as ensure timely payment of salaries. The result of class Xth and Class XIIth of the state are not at all encouraging and it is a cause of major concern. We have taken lot of steps in last one year that will drastically change the education scenario in our state. Our Government has decided to introduce State Board Examination for class V and VIII from the year 2017-18 to instil sense of responsibilities, accountabilities and quality in the system. We have also done away with No Detention Policy as it had led to deterioration of quality of education imparted in schools. One of the basic grievances of all teachers and students was of lack of books in the schools. This year, we have procured the books directly from NCERT and ensured that they reach out to the remotest schools of our state. Our state has finally got Sainik School which will start functioning from this academic year. This will have a far reaching consequences for our state as more and more youths from our state will be joining Indian Army at Senior positions in the years to come. This will not only rectify the skewed presence of Gazetted Officers in the Armed forces from our state. We have also brought massive changes in the way planning is done in education department. Chief Minister Samast Shiksha Yojana has been launched with an aim to identify critical gaps in education sector at the district level and fill them through bottom- up approach. We have also introduced Dronacharya Gurukul Yojana to identify talented students in school and nurture their talent. Through, this scheme we will also provide scholarships to the youths who wish to study outside the state. We are also aware of the hardships faced by the SSA Teachers. We have taken a historic decision to link the salaries of SSA and RMSA teachers with dearness allowance provided to regular Government Employees. A hike of 22% in salaries of SSA and RMSA teachers has been given this year. We have also created 400 posts exclusively for regularisation of SSA teachers. Zero enrolment schools would be shut down immediately while the teachers would be redeployed to the schools which has shortage of teachers. I would also like to add with every right, there come a responsibility and duty too. I expect that our teachers will go extra mile to ensure that students are given quality education and Government schools are able to compete with private schools when it comes to results of the students. My Government has taken many key initiatives in bringing gender empowerment and uplifting the condition of the senior citizens and disabled. We have enhanced the pension amount to widows and disabled to Rs. 2000 per month while pension to elderly has also been enhanced manifold. We have brought stricter laws to punish the convicts involved in crime against women specially minor. We have also enhanced the victim compensation in case of crime against women. We have also given incentives to girl child born in institutional health care. I strongly believe in the philosophy that if you educate a woman, you educate the complete family. Thus, we have introduced additional incentives to girl students who pass class 5. We will also be giving smart phones to the girl students who pass Class XIIth in the coming year. Our state has got large number of youths who are educated but are not getting employment due to lack of jobs. We need to tap energies of such youths in creating meaningful employment in the state. We have launched “Chief Minister’s Yuva Kaushal Yojana“with an objective to provide high end employable skill development training. The provisions we intend to set up 7 ultra modern facilitated skill development centre in unutilized Govt. buildings at Bomdila, Itanagar, Ziro, Pasighat, Roing, Namsai and Kanubari under PPP mode. We plan to send 600 youth outside of state to be provided high end employable skill development training in industrial driven job roles. Entire cost of the training, fooding, transportation, and lodging are being borne under the scheme. Agriculture, Horticulture, Fisheries and Animal Husbandry sector is the most important sector which provides employment to roughly two-third of the population. Our state has got huge cultivable area which if tapped properly can enhance the income of the people manifold. There is a need to incentive and train the farmers as per the requirement of the soil and area. There are some areas where agriculture crops are suitable while in some areas, cash crops under horticulture sector are feasible. In this year, we also organised a conclave on Perspective planning for Agriculture and Allied Sectors which was the first of its kind in entire North-East India. The conclave had 20 technical sessions with more than 100 experts coming from across the country to take part. The deliverables of the conclave are being documented which will serve as a roadmap for ushering farm revolution in the state. We have launched Chief Minister’s Sashakt Kisan Yojana with an aim to focus on the farm economy as per the needs of the area. The scheme has subsumed the earlier launched schemes like Farm Mechanisation, Tea and Rubber Cultivation and Land Terracing Program. This scheme will act as a watershed in promoting agriculture and allied sector as schemes in the villages will be proposed as per the requirement of the area and will encourage bottom-up planning. We have also launched Krishi Samuh Yojana to incentive Farmers Producing Organisation so that they can not only be trained about the latest farm technology but can also market their produce in a better manner. We are focussing on providing scientific cropping and end-to-end market linkages for the produce of our farmers. Our state has got huge tourism potential which needs to be tapped. Tourism industry not only boosts economy of the area but also creates jobs for the youths. It further enhances the image of the state and leads to exchange of culture among the societies. This year our State has won many awards like the Best Tourism Initiative in NE, National Leadership Award, Best Decorated Stand National, IITM Kochi 2018, Exotic Destination of the Year, IITM Kochi 2018, Most Promising New Destination, OTM Mumbai 2018. We have focused on strengthening of District Tourism Promotion Councils as well as promotion of Eco Tourism in the state by formation of Eco Tourism Society under Forest Department. We are also revamping the old unutilized infrastructure constructed under PIDDC scheme. Industrial Sector in our state has been neglected for long and now its time focus on this important sector especially in plain areas. The foothills of our state offer a very conducive environment for industries to flourish. Still, we are not able to invite industrial groups in our state. We are in an advanced stage of finalizing the Industrial Policy, 2018 which will help in attracting private investors from outside the state in identified priority sectors through a mix of fiscal and non fiscal incentives. Power sector has two aspects which are Power Generation and Power Distribution. Our state has got huge potential in Power Generation by means of hydropower. We have taken a bold decision to terminate those hydropower projects where the performance is very poor. We have decided to hand such hydropower projects to the PSUs as per mutual terms and conditions. Till date we have cancelled 15 hydropower projects and 100 more Hydro Electric Projects are in the process of termination. I am extremely happy to announce that this year two major Hydro Electric Power Projects will be commissioned. One being the Kameng HEP – 600 MW and Pare HEP – 110 MW which will substantially overcome the power needs of the State. As far as power distribution is concerned, under Deen Dayal Upadhaya Gramin Jyoti Yojana (DDUGJY), 671 unelectrified villages have been electrified either in Off-Grid or On-Grid mode. This is a huge achievement for our state as we have been able to provide electricity in the remotest villages where even road network in not available. Under Saubhagya Scheme, we will provide electrification to 44806 un-electrified households by 31st December 2018. While 39376 will be on grid connections, 5430 will be off-grid making it 100 percent. Under UJALA scheme, Govt has set a target to sell 8,00,000 nos LED bulbs, 1,50,000 nos LED Tubes and 60,000 nos of Energy efficient fans at subsidized rate. The achievement stands to 3,77,713 bulbs, 32,723 Tube light and 20,656 fans. We request all the citizens of the state to take advantage of this scheme which would result in saving 10.20 MW of power resulting to a reduction of more than 33557 tonnes of CO2 emission. In order to provide connectivity to remote and far flung areas, we have introduced 21 new TATA Sumos in those routes where big buses cannot ply in addition to induction of 23 more new buses last year. We also propose to introduce Xylo Services for economically viable routes in the state from this year. We have also launched e-Ticketing, a mobile application for the convenience of hassle free ticketing for the public and also check revenue leakages. Under Chief Ministers Seema Vikas Yojana, 165 beneficiaries were provided TATA Mobiles for self employment. For the first time in 43 years, APST received national recognition and was awarded National Public Transport Excellence Award for the best performing North East State Road Transport Undertaking. Road connectivity is the most important factor in bringing development in the state. We are constantly reviewing the progress of Trans Arunachal Highway Project. There have been instances where some Government Officials out of their greed have embezzled with the Land acquisition cost due to which entire state is suffering. We have taken strict action against such people. Various agencies like MoRTH, BRO, National Highways and Infrastructure Development Corporation Limited ( NHIDCL) and State PWD are implementing the total length of 2537 Km National Highway projects in the state. State PWD has completed 10 nos National Highway Packages covering 232 KMs till date. The package from Pangin-Pasighat has made significant progress by achieving 96%. The status of other stretches of the NH executed by different agencies is in advance stages of construction. This year we have completed the double laning of Changlang-Margherita road. Over the next couple of months several important projects would also be completed including the improvement of Nari township road, Seppa-Chayangtajo road, Miao-Namchik road, Gacham-Morshing road, Jangthung-Chingdan road in West Kameng, construction of ring road within Tawang Township. So far under the PMGSY programme, 1046 road works comprising 8885.33 km road length for an estimated cost of Rs. 5946.82 crores has been sanctioned for providing connectivity to 1467 habitations. As on June’ 2018, 802 nos. of roads with 6765.00 km length has been completed connecting 909 habitations. During the FY 2018-19, a target for 1400 km road length has been fixed by the GOI to connect 50 habitations. The department is contemplating to achieve 1600 km target. At present, 244 nos of road works of 2111.28 km road length are under various stages of construction. Our State Government has taken a very important decision regarding selection of site for Airport in Itanagar. We have selected Hollongi as the final site for construction of Airport and have significantly reduced the relief and rehabilitation costs due to which Governement of India has in principle agreed to sanction the airport. We are now approaching Government of India for funding this important project. Once the project is sanctioned, this will be a huge milestone for the people of our state as it will open up plethora of opportunities. Another major milestone in this sector is the starting of civil flight from Pasighat Airport. This has opened up the flow of tourists in the eastern sector of our state. We are also hopeful that Tezu Civil Airport will be functional from this year itself. Rail connectivity got a major boost this year. While new railway lines has been approved, surveys of in some major rail route like Bhalukpong-Tenga-Tawang, Pasighat-Tezu-ParashuramKund-Rupai, Dumduma-Namsai-Wakro, Dangri-Roing, Deomali-Naharkatia, Kharsang-Miao-Nampong-Deban, Tinsukia-Pasighat via Kanubari are in various stages of progress. We have now two dedicated Rail services from Itanagar to Delhi with one – being “ARUNACHAL EXPRESS”. It is matter of great pride for Arunachal Pradesh that the Union Ministry of Urban & Housing have sanctioned two Smart Cities for Arunachal. We are fortunate to have Itanagar and Pasighat listed in the Smart City program which will substantially enhance the quality of urban life by providing core infrastructure, a clean and sustainable environment and application of smart solutions. We have also completed the construction of long pending DK Convention Hall which has now become an important center for holding national level conferences in the state. We will also complete the major projects like ISBT, Inter State truck Terminal, Flats under Rajiv Awas Yojana, Officers and Legislators Accomodation this year. Our Team Arunachal Government has mooted a comprehensive plan to develop atleast one village in each constituency as Smart Model Village under Chief Ministers Adarsh Gram Yojana. For this we have earmarked Rs. 1.5 Cr for each selected village. We will develop a blueprint of village level infrastructure through infrastructure mapping exercise for decentralised and effective planning under Chief Minister Gram Vikas Yojana. In addition to this, by leveraging technology and through open innovation, we are working in collaboration with the Smart Village Movement and UC Berkeley to better the lives of our villagers by connecting them to the global market. 100 villages will be taken in the first instance which will be scaled to all the villages in a phased manner. It is a matter of pride that we have attained the ODF status on 31st December 2017, 22 months ahead of the Nations target under SBM (G). To ensure clean and potable water supply in the state, we have commissioned two mobile water testing laboratories to facilitate onsite testing of routine parameters along with heavy metal and bacterial contaminations. It is one of the milestones of the State Government to ensure and promote Public Health via Safe and Potable water in the State. Under GOI scheme National Rural Drinking Water Programme (NRDWP), last year we have been able to cover 263 rural inhabitations and 263 villages state plan scheme. To encourage cleanliness and hygiene in all the districts, we have instituted award for the cleanest village and cleanest District at the rate of Rs 50,000 and Rs 2 lakh respectively. With an objective of preservation of Indigenous Culture in the State we have created Department of Indigenous Affairs in the State. As the department is in its nascent state, we have in our Budget Announcement proposed to take up construction of Indigenous Cultural Centres in all the Districts of Arunachal Pradesh and take up Indigenous Affairs Office & Indigenous Convention Hall at Itanagar in a phase manner. In addition to task like Codification of Indigenous customary laws and its publication, printing and publication of Indigenous Folk Literature, we are also taking up the documentation of Tangible and Intangible Assets (Papum Pare and Siang District proposed as pilot projects) this financial year. The Five Year Action Plan has been prepared for the same and the documentation of Tangible and Intangible Assets of all districts shall be completed within five years. We are providing fund for celebration of Local Indigenous Festivals and also organising cultural exchange, awareness campaign, publicity, cultural visits (national and international) etc. programs in regular intervals. Promotion and development of sport and games has been the endeavour of our government. Along with the national programme like Khelo India, we have launched our state flagship programme Hangpan Dada Memorial Trophy wherein we have seen encouraging participation of 3180 participants at block and district level and 1219 participants at the State level. Our youths from Sangay Laden Sports Academy have also participated National as well as International level and earned laurels for the state in the events like Archery, Boxing, Wushu, Weight lifting, Judo & Karate, etc. We are strengthening the Sangay Laden academy by upgrading it to Higher Secondary Level. We will also be starting one more academy on the lines of Sangay Laden Academy in Tirap, Changlang and Longding region. Technology has been making a steady progress all over the world; and India, undoubtedly, is a front runner in this field. In the area of Information and communication technology, we have made a significant headway. The Digital India Programme was mooted by the Government of India to use this communication technology in the service of common man across the country. Arunachal Pradesh with far-flung villages and inaccessible pockets could harness the different aspects of governance and reach out to common people through this programme. With that objective in vision, massive IT driven initiatives have been planned for roll out in the State under which delivery mechanisms of Government services will be more effective than ever before. I take immense pleasure to state that with our persistent efforts in the face of many challenges, today the State has started providing 6 very important certificates such as Permanent Residential Certificate, Dependent certificate, Character Certificate, ST Certificate, Temporary Residential certificate and Income Certificate with a total of 2,047 certificates being issued till date. In order to cater to the needs of common mass as access points for delivery of public services we have 79 Common Service Centres (CSCs) functioning across the State. It is gratifying to make a mention here that today Indian visitors to the State are able to obtain Inner Line Permit to visit the State through online mode without any hassles and at a considerably lower cost, with a total eILP being issued standing at 49,200 till date. In the service of students, through National Scholarship Portal (NSP) an amount of Rs. 15, 42,74,800/- has been disbursed as Scholarships/Stipends to Students of Arunachal Pradesh by ambitiously onboarding State scholarship schemes of SJETA and Higher & Technical Education depts into NSP. Quite recently, we have successfully launched CM Dashboard project for expeditious monitoring and setting targets for department and district level activities through a single window for Agriculture, Education and Health Departments with sole objective to improve the performance of Departments and the State as a whole. In order to bring transparency and accountability in public procurement the Government has issued notification for mandating procurement of goods and service through Government e-MarketPlace (GeM) initially for Departments /PSUs/Agencies/Councils etc for Itanagar and Naharlagun. Govt employees’ capacity building is one of the important aspects for realise of good governance. The ultimate objective of Arunachal Digital Mission is to compress the physical distance, cut on time, energy and money to deliver the public service effectively. Hence, I urge all the officers, technocrats and outsourced agencies to actually work in a mission mode to make Digital initiatives of Arunachal a great success. Arunachal is a land-locked state with extreme hardship for common people to move from one place to the other. I have the knowledge of suffering of poor people while travelling from a village on foot for miles and miles to reach an Administrative centre to get a utility service. Hence, in a state like ours promoting and implementing Digital initiatives is more useful and has a greater relevance. Our Govt is trying its best to implement a plethora of developmental schemes for the people which, if implemented properly, can take the state to a new height in terms of development. I am sure; all the Digital initiatives will help accelerate the implementation process in the state. Hence, I expect that all people involved in this endeavour should remain committed to their responsibilities and discharge their duties in the larger interest of the poor and needy people of the State. Arunachal Pradesh Police has started many new initiatives to prevent Crime, protect public and secure public trust. Time-bound recruitment process for around 1800 personnel of various ranks are under way. Over 700 new posts of Civil Police have been further sanctioned to address the shortage of manpower in the police department. Over 1500 police Constables who have put in 20 years of service or more shall be given special grade promotion to boost their morale and self esteem. In line with Digital Arunachal and the need for improving citizen connect, a new website has been developed through NIC, Itanagar. Along with the website, a online Portal for lodging of Citizen Grievances has also been launched in order to improve accountability and responsiveness. An Emergency Response Support System (ERSS) is being implemented in 15 districts with the assistance of Govt. of India. It will replace emergency numbers of Police, Fire and Health Department with a common number ‘112’. Similarly, a city surveillance project for Itanagar – Naharlagun Complex will be implemented very soon. It will not only help in monitoring the law and order and traffic in the twin cities, but also help in post-crime investigations. In order to improve the welfare measures of Police Personnel, multiple initiatives have been taken along with the rejuvenation of Police Welfare Society. Health Check-up and wellness camps were organized throughout the state. To promote Yoga as a fitness activity, a month-long Yoga sessions were conducted in all districts which culminated in Itanagar on the International Yoga Day. All these initiatives have improved the morale and motivation of the Police personnel. The department is working to leverage improved motivation of personnel with technological interventions, community policing and enhanced manpower and resources for better policing and improved law and order environment in the state. We in Arunachal sit in the lap of nature, I want to make Arunachal the wellness destination of people all over the world. I want to bring the best health facilities to Arunachal Pradesh. I want to make Arunachal a state where we have 100 percent pass percentage and our schools are equipped to give the best facilities to our students. Our state is best connected to other parts of India because we all speak Hindi, I want to make it the best connected state via roadways, highways and airways. I want our state to become an industry friendly state. I want to make Arunachal, Happiest state of India. On this 15th day of August as we celebrate our freedom, let us all pledge to serve the State and our nation with renewed promise each day to work towards the areas I have outlined today- for a better Arunachal where- each one of us are happy and contended. Let us take immense pride in being an Arunachalee and display by our actions that will draw appreciation from the rest of the world. In the end, I am extremely proud to have seen the excellent parade displayed by the Police, Para Military, NCC and Students. I take this opportunity to thank each and every citizen of our State in believing in the programs and policies initiated and implemented by the State Government. Let us all join hands in the spirit of Team Arunachal to realise the “Dream Arunachal” story.